Have hindsight with hindsight. That’s our challenge and new word today: KINDSIGHT. The popular phrase says, “Hindsight is 20/20.” Implied in this statement is complete understanding and knowledge comes after a thing or event is over. What is unseen during is clear after. Kindsight is managing the mind-heart response after the thing or event is over. Guilt is the “I Owe You” emotion. It keeps us on a wheel of debt to pay others back and make things right. How do you reflect on your past when triggers force your mind that way? Do you view with hindsight, and take a slight detour on the guilt wheel to nowhere? Or, do you take a breath and consider the lessons learned? The strength to cancel the debt comes from the permission we give ourselves to learn the lesson and close the case. Kindsight makes all the lessons serve the new creature we are in Christ and are becoming. Kindsight removes us as judge of us…and banishes the guilt wheel of debt. It’s a deliberate effort to form new heart habits. And that’s our challenge — to not deceive ourselves to think that more Bible study, more prayer, and louder worship deletes the guilt will. No. We learn kindness to ourselves and we cancel the debt. We silence the squealing repetitive creak of that wheel when we agree with God’s kindness…TO US…AND decide to receive that kindness and extend it to ourselves. The word kind in Luke 6:35 (above) is seen in other references. Matthew 11:30 — For my yoke is easy (kind), and my burden is light. Guilt is not the Lord’s yoke. Romans 2:4 — Or despisest thou the riches of his goodness and forbearance and longsuffering; not knowing that the goodness (kindness) of God leadeth thee to repentance? God’s kindness leads us to go a new direction…toward Him. Ephesians 4:32 — And be ye kind one to another, tenderhearted, forgiving one another, even as God for Christ’s sake hath forgiven you. 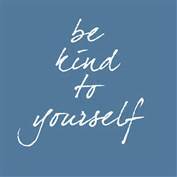 As much as I am kind to me can I extend kindness to you. 1 Peter 2:1-3 NASB — Therefore, putting aside all malice, and all deceit and hypocrisy and envy and all slander, like newborn babies, long for the pure milk of the word, so that by it you may grow in respect to salvation, if you have tasted the kindness of the Lord. If God’s kindness made you hungry for more, then empty the heart weight — anger, greed, jealousy & guilt. 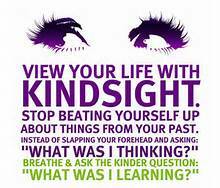 Choose to continue the process with Kindsight. Selah, and love to all. ← Intercessor, Remember to Fear God.